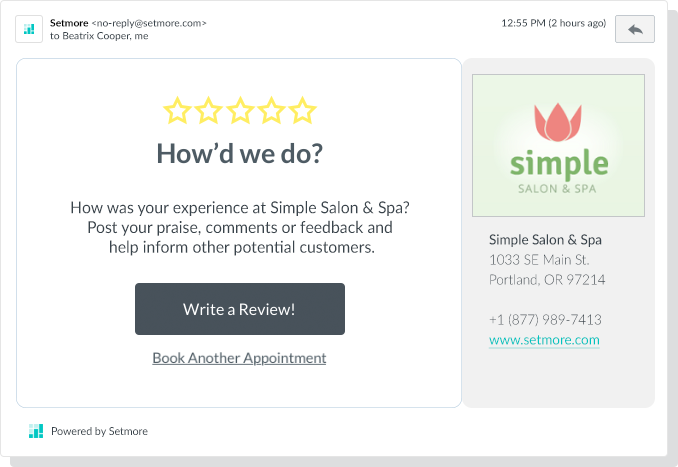 Approximately 1-hour after any appointment, Setmore will automatically email your customer and request that they post a review directly to your free, public Booking Page. Key Benefit: Positive reviews help encourage new and potential customers to book a service, while negative reviews give you feedback on how to improve the customer's experience. Use reviews to your advantage and learn from them! Below we'll walk you through how to set up taking reviews on your Booking Page, as well as how customers can post a review. Customer reviews are enabled by default when you sign up for Setmore. Follow the steps below to disable or enable the Customer Reviews feature. Doing so will remove the "Reviews" section from your public Booking Page. 2. In the Booking Page window, click the "Review" tab. Now in the main viewing area, you'll see an On/Off switch next to "Enable Reviews." Click the switch to activate or deactivate customer reviews. Note: To help ensure Setmore meets GDPR compliance, we will be rolling back the "Request for Review" email feature that we launched on April 25th. The feature will be disabled for all users before GDPR goes into effect on May 25th. We plan to review, refine, and re-launch a GDPR-compliant version of the feature in the near future. The "Write a Review" button will link directly to the Reviews section of your Booking Page, where customers can then submit a review. If you don't want Setmore to send an automated email requesting a review, follow the instructions above to disable customer reviews. Disabling customer reviews will also disable the automated email that requests a review. 1. On your Booking Page, customers will click on the "Reviews" tab in the left-hand navigation menu. Here they'll select a rating (one to five stars), type in a review, and click "Submit Review." 2. The review will then appear in the Reviews tab, under "Pending." As the account holder, you may choose one of three options: "Approve & Publish" the review, which will make it visible on your Booking Page; "Hide" the review, which will keep the review filed in your system but will not make it visible on the Booking Page; and "Delete," which will delete the review from your system. Note: You must take action to approve a review before it will appear on your Booking Page. If you don't approve or reject a review, it'll sit in limbo in the back-end of your Setmore account. 3. If you approve a review, it will appear under the "Reviews" tab of your Booking Page as depicted below.